So I actually decided to give you a recipe you could use for Easter, you know, before Easter is actually here. Look at me planning ahead. I’m kind of proud of myself. I think it’s the first time I’ve managed that since starting this blog. We’ll see if I can keep it going. Don’t get your hopes up, but I’m gonna try! Of course, breakfast foods are the best, and I can happily eat them at any time of day. So trying out a bunch of stuff for Easter brunch for a few weeks before Easter? Well that’s just my idea of heaven. What is it about breakfast food? Why is it so good? I mean, the pancakes and waffles and french toast makes sense. You cover it in syrup or berries and whipped cream and it’s basically dessert that’s appropriate for breakfast. Obviously that’s a good idea and everyone loves it. But eggs with a bunch of savoury stuff crammed inside? Why is that so darn good? Maybe it’s the melty cheese on top and the other kinds of cheese shoved inside? Whatever the case may be, eggs make me almost as happy as the sweet dessert-like food masquerading as breakfast. Maybe because they’re so easy and you can really put whatever you want in them and they’re still phenomenal? And they are totally appropriate for dinner as well as brunch or breakfast. Yay for versatile meals! These mini tomato, olive and feta frittatas were basically me using up what I had in the fridge and they were amazing. Lovely when that works out isn’t it? There wasn’t even any meat in this meal (I served it with muffins like the true, addicted-to-baking person that I am!) and my husband enjoyed them! That says something. He’s the type of person that figures dinner without meat is basically a waste of time, and will be looking around for the meat like I must be hiding it somewhere. So him raving about these mini frittatas told me it was a winner! Brinner. It’s the best meal. Note: I used 2% milk in these, but I think you could substitute another kind without issue. The corn does tend to fall out everywhere when you cut into them. I liked the sweet bursts of corn, but if you’re going to take one on the go you might want to leave it out, or at least cut back on the amount! Parmesan would be a good substitute for the asiago cheese. If you'd prefer one large frittata, I think this would work well in a 9 inch pie plate as well, the baking time should be about the same, but it might need a little longer. 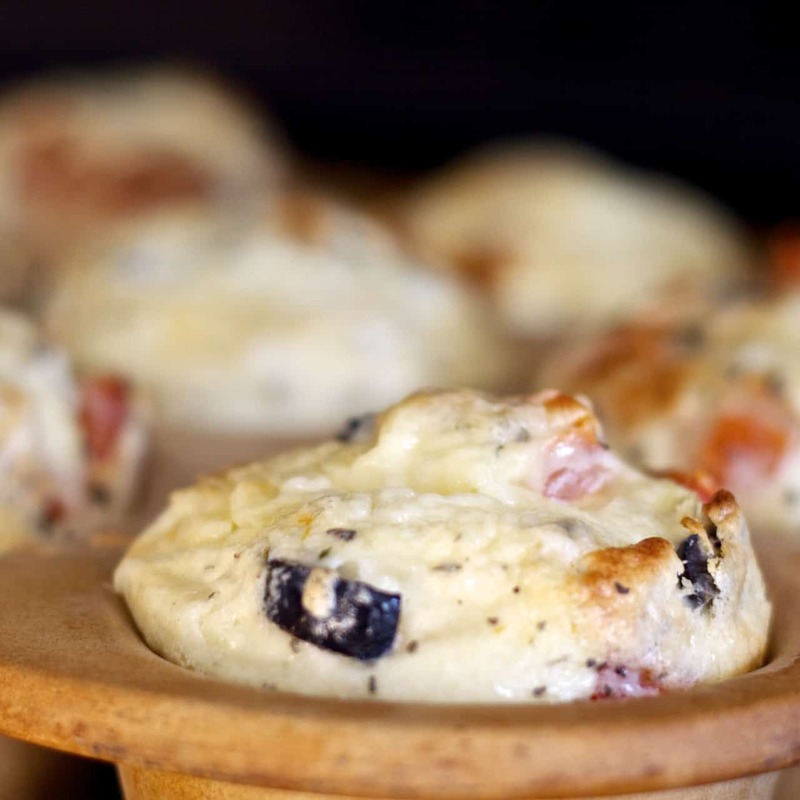 Preheat the oven to 350 degrees F and spray a muffin tin with non-stick spray. Set aside. In a large bowl, whisk together the eggs, milk and cream cheese. I used an immersion blender to get the mixture nice and smooth. Add the feta, tomato, corn, olives, salt, pepper, mustard, garlic and basil and stir together. Scoop the mixture into the prepared muffin tin, filling the 12 cups equally. They should be just about full. Bake the frittatas for 25-30 minutes until a toothpick inserted into one comes out clean. Sprinkle the tops of the frittatas with the grated asiago cheese and broil for 3-4 minutes until lightly browned and melted. Let sit for 2-3 minutes before removing them from the muffin tin, or they’ll fall apart as you take them out. They will sink as they cool. 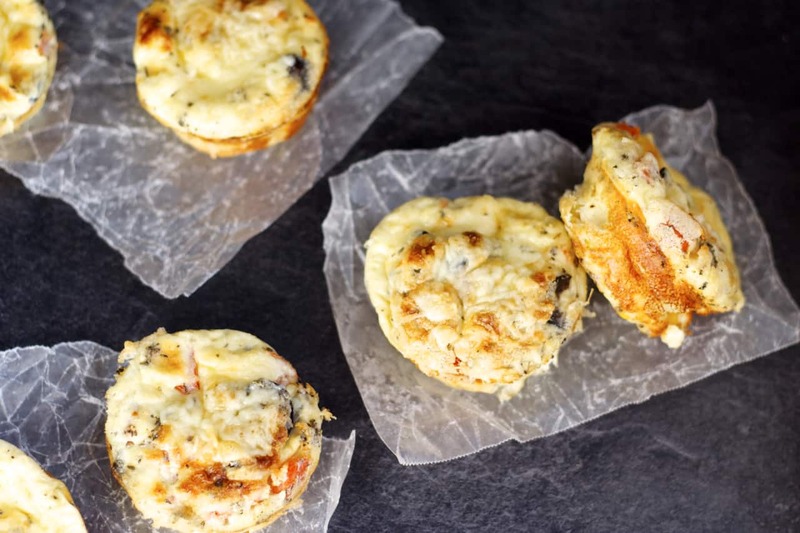 The mini frittatas reheat nicely if you have leftovers, just keep them in an airtight container in the fridge for 2-3 days. No breakfast for dinner?! That's really unfortunate, it's the best! He's missing out! :) Thanks Ashley! Breakfast foods are my favorite too! These frittatas look fantastic! Love the tomato, corn and olives! I don't know what it is, we are big breakfast lovers here too! Everything, sweet and savory -- it all rocks! 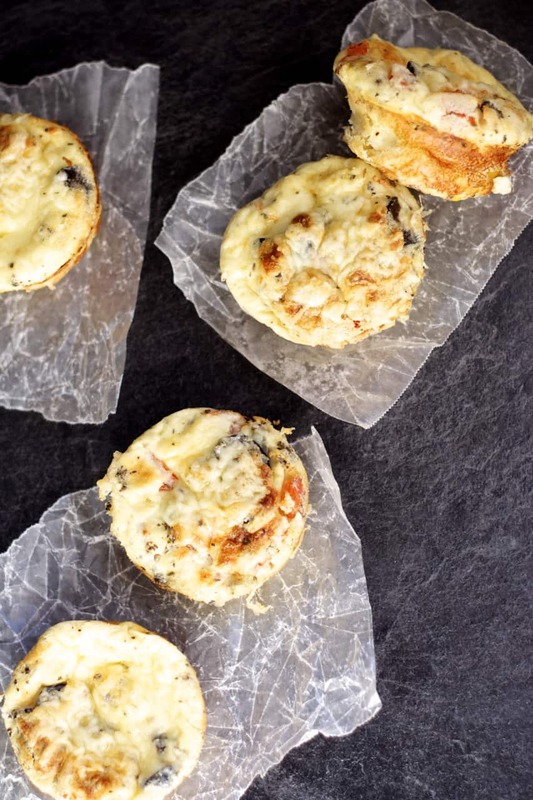 Especially these frittatas! Breakfast is just the best! Thanks Ashley! You may know, I love frittatas...every which way. These are beautiful and rustic and I love the addition of the olives. I've never done that! This is my kinda food! Haha, glad I'm not the only one that doesn't plan weeks and months ahead of time! Thanks Cyndi!